I don’t need many reasons to justify eating cheese for ANY occasion. Hence the reason I love both Tex-Mex and authentic Mexican dishes. 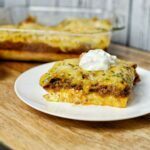 The recipe for my great-tasting Low-Carb Tex-Mex Casserole came about when I was looking for ways to enjoy some of my cheesy favorites but wanted to forgo the carbs. The secret to this dish is the egg and Greek yogurt cream cheese layer. It is simple, fluffy, slightly creamy, and very fulfilling — which allows you to chow down on this casserole minus the guilt or the full-filling after effect! It’s my go to at home quite often. 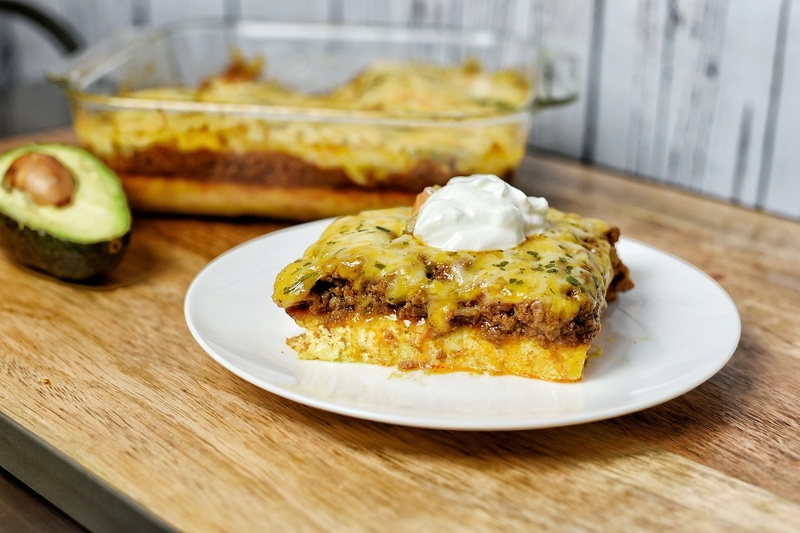 The well seasoned ground beef mixture is the perfect protein to accompany this dish . Blended with delicious spices and a tomato base, it serves as the hearty and middle layer to the casserole. The finishing touch is the generous layer of Colby cheese. Once ready and served, I top it off with a dollop of homemade guacamole and sour cream. Tasty perfection! When you don’t want to give up great tasting Tex-Mex but you want to keep an eye on your carb count, this dish is a great option! Cut the greek yogurt cream cheese into small chunks. In a large bowl, add greek yogurt cream cheese, eggs and garlic powder. 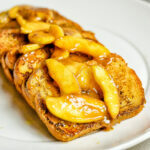 Using a hand blender, mix the ingredients for 5 minutes or until smooth and it begins to rise. 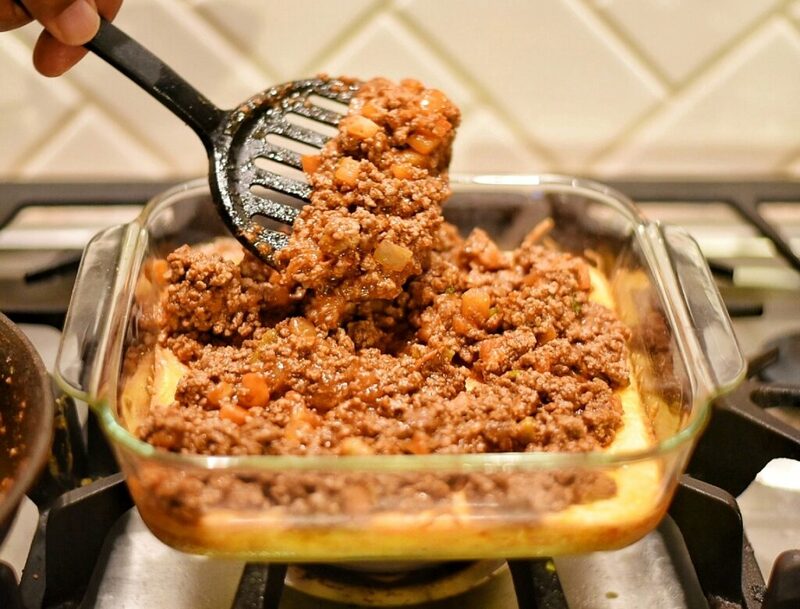 Coat baking dish with butter or non-stick spray and pour ingredients into baking pan. 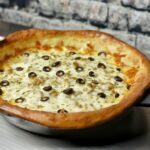 Top the ingredients off with 1 cup of cheese and bake in the oven for 20 minutes at 350 degrees. While the bottom layer is baking, pre-heat pan on stove top at medium heat. Add ground beef to hot pan and brown. Make sure your ground beef is broken down into small pieces for cooking. Once your beef is browned, drain the extra fat and add tomato sauce, pico de gallo, chili powder, goya adobo, salt, pepper, cumin, paprika and red pepper into pan. Mix well and allow to cook on low heat for 5 minutes. When the baking dish is complete, remove from oven and allow to cool for 5 minutes. Once cooled, add your beef ingredients into the baking pan and spread evenly. Add the other 1 & 1/2 cup of shredded cheese to top of dish and sprinkle on some parsley. Bake at 350 degrees for 10 minutes. You can top your casserole servings with your Tex-Mex favorites like guacamole, sour cream, and/or pico de gallo.